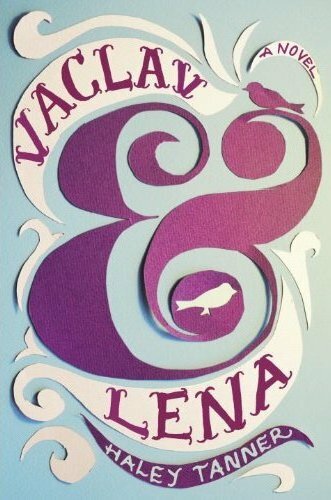 Book Review: Vaclav & Lena by Haley Tanner | The Nerdette's Guide. I am always a little wary of books that I have read the reviews of before starting them. It tends to color my opinion and that sets me off, raising my expectations and essentially asking for me to get my hopes dashed. Books that I have read poor reviews of (or read nothing about at all) fair better than those whom I have heard good things about. I judge less, am a bit more patient with them and willing to see if I can understand what the author wanted to get across and what actually was conveyed. I bring this up because I first came across this book when I was reading the New York Times’ review of it. It was a favourable review and I was admittedly more receptive of what the reviewer had to say because I had watched the video about Ms Tanner and her late husband earlier in the month. I found theirs to be such a sweet and touching (though not overly saccharine) story that I almost wondered if the novel could truly compare. Could fiction match the compelling reality of the author’s life? Or would I always be expecting better from someone whose story I knew even a small fraction of? I can safely say that this book did not disappoint. I am admittedly a sucker for stories about wayward immigrant boys who have a fascination with magicians. This can largely be blamed on Michael Chabon’s The Amazing Adventures of Kavalier & Clay and I had to set that book aside in my mind to truly embrace this one. Comparisons, no matter how strange, are unfair to both parties. Vaclav and Lena is the story of a boy and a girl, both Russian immigrants, growing up in Brighton Beach, Brooklyn. They are ten when we first meet them and most of the seven years that pass between the start and end of the book is handed to us in short bursts. This might look troublesome when simply laid out like that, given how much about a person changes during ANY seven years of their life, but especially during adolescence. But it is handled in such a way that it not “seeing” it isn’t a burden. Things that are relevant to what comes to be are given in snatches, pieces that don’t always seem like they are going to fit together until suddenly they do. Most of the back story is given in the form of recollections, often after the something has triggered a reaction in the “now”. It is a very real way to broach the passage of time, especially with characters whose history is so different and often worrying. This is a book that runs the risk of being dismissed as a “love story”. It is a love story or set of love stories, though not in the obvious Nora Roberts sort of way. It deals with the love a mother (Rasia) has for her son (Vaclav) and how she wants to give him the world, but worries about the world that he lives in. His world is so radically different from her own and while she wants him to have the best of everything, she has a fear of that unknown. She handles things differently than she had once dreamed, struggling to adapt not only to being a world that is foreign to her but to the nature of raising a teenager in that world. I loved how the book spent so much time developing Rasia, explaining her behavior and her logic without trying to moralize or teach. She came off as a real person on the page. You could feel her pain as she finds herself something of an outsider in this important part of her son’s life and how that wasn’t what she wanted. Primarily revolving around Vaclav, in which both Rasia and Lena (a girl from his past, that also changes his future) play critical roles. What is strange is that despite being one of the titular characters, part of the pairing that pushes the narrative along I feel like I knew the least about him by the end. I only knew parts of his story, the parts that were relevant to Lena and magic, but little else. This makes sense given that the greater part of the story deals with Lena, her history and what happened in the years apart. I am grateful that I found her story to be a compelling one, despite its tendency to slip into strange clichés every now and then. What really helped to sell Lena’s story were the parts of it told from both Rasia’s and Emily’s (Lena’s adoptive mother) points-of-view. Lena’s only recollections were muddled in a very realistic way. They were informed more by feelings than facts, which makes sense given how old she was when they happened to her and how small her world was. This is a story about mothers and their children, how they might not understand them but love them and their complexities all the same. It is a story about loving someone despite how confusing and frustrating they can be. About the risk of loving someone without knowing all the facts, about the secrets that we keep that run the risk of ruining us. It’s a sweet story and the novel ends with the resolution of the mystery, but not of the story of Vaclav and Lena. That’s fine. There is no need to push past what happened to these two after they were seventeen. No need to give them a happily ever after. It answered the most pressing questions in the simplest of ways. I read this book in about two days. I was engulfed by it and the closer I got to the end, the more I regretted my haste. This is a book that has crawled in under my skin and made its mark. Finishing it left me feeling slightly hollow, like I wasn’t ready to say goodbye to them. It is a feeling that tells me that I have just finished something marvelous. It’s rare, but it has the tendency to sneak up on me when I least expect it. It is like missing a friend, remembering something unexpected and fills me with an odd nostalgia. That tells me that it is a book worth noting. Reading it was like having an intense and brief conversation in whispers with a stranger. We might not ever see each other again, but the impact can be felt long after it is done. I am confused I just have finished to read book Vaclav and Lena. I thought that Vaclav made up story for Lena because he did not want to hurt Lena. My daughter read this book also and her opinion That Vaclav beautiful story about Lena’s parents is truth. We can not decided who is wrong and who is right. In the end of book says Lena’s real mom, Emily, knew that this was not truth… Real mom ? I thought Emily is her adoptive mom? please help us to figure out was Emily Lena’s real mom or adoptive. I really love this story. My tutor gifted me this book and I was rerading non stop then gave this book to my daughter She is 15. We really want to understand end . Emily was Lena’s adoptive mother. The story that Vaclav told Lena about what happened to her real mother was just a story, a fictionalization of the truth meant to comfort her. That story essentially became the truth even though Vaclav, his mother and Emily know otherwise. Emily is her “real” mother, in a sense, giving Lena everything that she didn’t get from her biological family. I hope this helps.